Full disclosure: I work on this campaign. I sincerely believe in participating in this cause and helping Kids In Need. All you have to do is to take the pledge on www.wetones.com. Your pledge (with just one click) will trigger a donation of Wet Ones to a child in need. Take the Pledge to Help Stop the Spread of Germs: "Pledge today at wetones.com to help keep your family and community healthy this cold and flu season. You'll get a valuable coupon and we'll provide a donation to The Kids In Need Foundation for the first 100,000 pledges submitted!" 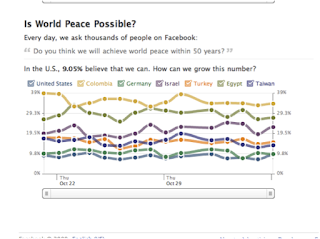 World Peace - It Can Happen on Facebook! Coming from a multi-cultural family and having studied cross-cultural communications, I always thought if people got close enough they would appreciate their differences. Friends and then relatives from different countries can really move us closer to a much higher level of acceptance. Finally, here's living proof from Facebook. 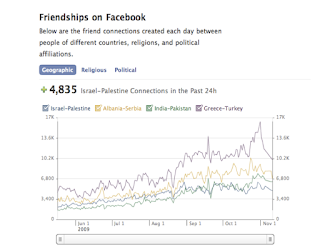 The "peace page" tracks friendships among people from nations who have been in historical conflict. You can watch it in real time, as people connect on Facebook. Then, there is the survey across nations. Question is whether you believe world peace is achievable. Americans are most pessimistic. Columbians are most optimistic. I guess being exposed to war news is depressing, and making strides against FARC boosts morale! Can Zappos Service Get Any Better? "Although you originally ordered Standard (4 to 5 business days) shipping and handling, we have given your order special priority processing in our warehouse and are upgrading the shipping and delivery time frame for your order.Your order will ship out today and be given a special priority shipping status so that you can receive your order even faster than we originally promised!"